Ever since a blood-curdling wail pierced the murky darkness of the moors surrounding Baskerville Hall alerting Holmes and Watson to dastardly deeds, hounds galore have come to play their full part in mystery and detection. As is apparent from these gripping stories in this delightful anthology, dogs are not just the faithful friends their masters take them to be. When confronted by evil intentions of man and master, their intuitive sense of ethical standards will tell them their faith lies in altogether different direction. Hound Dunnit is the first book to do justice to “canine” cunning and intelligence in the criminal underworld. It comes with a humorous and pertinent introduction by eminent story-teller Isaac Asimov who lends his name and authority to promote the rights of this important mystery minority group. 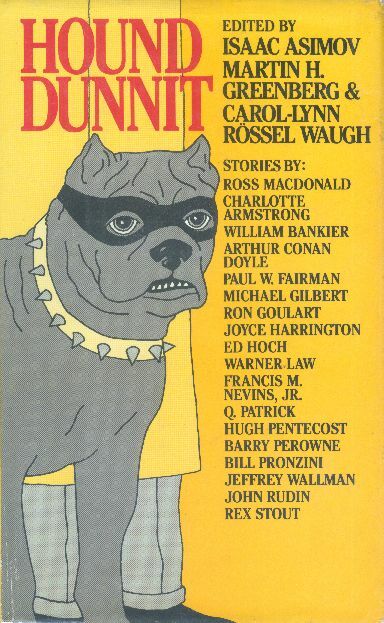 And from the pen of illustrious writers as Ross Macdonald, Arthur Conan Doyle, Rex Sout, Joyce Harrington and many others, the reader will encounter the singular adventures of dogs and the reputations they give rise to: dogs as detectives, as spycatchers, dogs trained to lure the enemy into a trap, dogs that sacrifice themselves so that others may live…dogs, in fact, finding themselves in a whole host of intriguing and mysterious circumstances. As a topnotch collection of mystery and suspense stories by the most talented writers of the genre, Hound Dunnit proves once and for all that dogs and mysteries have a natural affinity. I’m not a mystery buff, and I really do not get excited about dogs—whose very loyalty to and fondness of humanity I take as an indication of their stupidity—so it’s hard for me to feel fair and unprejudiced about this volume. I will confess, I liked exactly two stories in this book (none of which are by the Good Doctor, by the way). One was the Sherlock Holmes story, “Silver Blaze,” which isn’t my favorite Sherlock Holmes story by a long shot (I guess The Hound of the Baskervilles was too long to include, anyway) but is far from my least favorite, too. The other is “Lincoln’s Doctor’s Son’s Dog” by Warner Law. The rest I would gladly have passed on. Still, I feel badly giving a low ranking to a book when it obviously isn’t aimed at me in the first place, so I’m recommending it to dog-loving mystery fans with fingers crossed, in the hopes that they’ll enjoy it an awful lot more than I did.